The Cathedral of St. Matthew the Apostle is the first parish chosen to be profiled in an series that highlights the parishes of the Archdiocese of Washington. Thanks for turning out in good numbers this past year for hospitality events! Find out why we believe the work of the Hospitality Committee is deserving of your support and participation as a volunteer. RCIA - It's a Process! Do you know someone interested in becoming a fully initiated member of the Church? 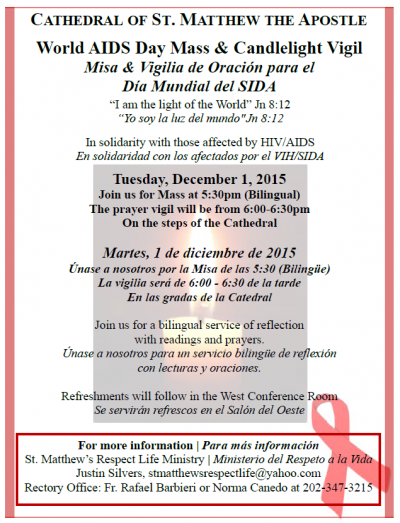 Will you share this RCIA flier with him or her, or them? RCIA meets every Wednesday from 7 to 9pm. Read more about RCIA - It's a Process! Monsignor Jameson is now tweeting! Please follow him at msgrjameson. He will be tweeting news and events, spiritual guidance and historical facts about St. Matthew's and its environs. Read more about Follow Msgr. Jameson! Morning Prayer, one of the offices of the Liturgy of the Hours, is prayed on Tuesdays and Fridays at 7:30am in St. Anthony’s Chapel, following the 7am Mass. We gather to give praise for a new day and all that is yet to be, relying on the Holy Spirit who unites the Church at prayer. Feel free to join this small group. Prayer leaflets are provided each day. A New Book about St. Matthew's! Are you curious about the origins and history of St. Matthew’s as a parish? A new book featuring historical narrative, stories, and images from the past 175 years is now available. Purchase a copy at the Rectory, or order your copy for delivery! View the order form. Read more about A New Book about St. Matthew's! Read a Catholic Standard response to a Washington Post online post, "Report: 1 in 6 hospital beds in U.S. is in a Catholic institution, restricting reproductive care"
Pope Francis' visit to St. Matthew's Cathedral, long impressed on our hearts, is now memorialized in a commemorative plaque on the wall behind the statue of Mother Teresa and the Homeless Man. Read more about Pope Francis Was Here! Each year, we invite experienced singers of the parish to join the Schola Cantorum for our Advent Lessons and Carols and Christmas Eve Choral Prelude and Mass at the Cathedral. Find out what we're looking for, and how to audition.